Go to "My Account" in DigitalCommons@UMaine. Click the "Sign up" button under Create New Account. Enter a valid maine.edu E-mail address. 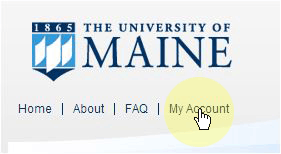 Enter your institutional affiliation (select University of Maine—Main from the drop-down menu). Click the "Sign up" button at the bottom of the form. You will receive a confirmation E-mail at the address you provided. Follow the link and any additional instructions in the confirmation E-mail. Questions? Contact your Subject Specialist or kimberly.sawtelle@maine.edu. Now you have activated your DigitalCommons@UMaine account, you're ready to request access privileges to self-archive within a particular series. Summary of the full-text content you wish to archive. Questions? Contact your Subject Specialist to learn more about identifying your discipline commons.